The putter is the most frequently used club in the golf bag. Casual golfers might neglect their short game, instead focusing on the sexier aspects of the game, such as taking out the driver and hitting for distance at the driving range. 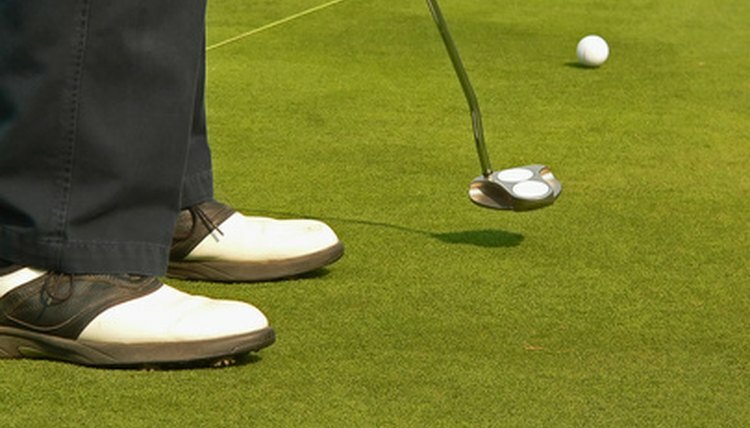 By taking the time to work on your putting game, you can cut valuable strokes off your round. Being able to control your first putts will put you in position for an easy two-putt and keep you from squandering a solid approach. Find a putter that you enjoy putting with and keep using it. Because of different styles and different inserts used in putters, every putter reacts differently. Switching putters will make it difficult to develop consistency in your short game. Relax when standing over the ball. Being tense will lead to a jerking putting stroke, which will lead to erratic distances on your putts. Turn your shoulders to move the club backward, and then move the club back through the ball. Unlike full swings, in which the hips play an important role, all of the rotation of a putt comes from the shoulders, while the lower body remains stationary. Practice putting for distance. Pick a target and attempt to hit balls that travel within a few inches of the correct distance to that target, even if you do not read the line properly. Perfecting your distance control will help ensure your second putt is makeable. Practice on a course's putting green before playing a round. The putting green should be cut in the same manner as the rest of the course and feature the same grass. Practicing on the putting green will allow you to get a feel for how the greens are playing before you are on the course and your strokes matter.